Land developers, engineers and local governments are particularly concerned with these surfaces because certain projects require compliance with storm water discharge regulations; in this situation, the percentage of impervious areas based upon pre and post development may be integral. AXIS can incorporate data that has been compiled in house with land use and soils data to calculate accurate impervious surface areas along with your latest site plans. 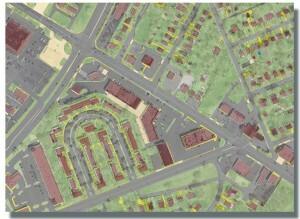 Easily obtain map data for artificial structure areas such as driveways, parking lots and more. Contact Us to discuss your next impervious surface project.